Downloaded it today bc I hate how the iPhone takes you to the next message in your inbox after deleting an email when you’re in the email message itself. Deleting Outlook app 5 mins after downloading it when I realized it won’t Sync with iCal. Not going to manage 2 calendars so it’s pointless. Not sure what the issue is but even if you leave this running in the background, after receiving notification of new emails, when I go into the app, they are not initially there and I must wait a couple seconds for them to star showing up. Compare that with ios mail where when you open the app, the new received emails are there waiting for.me already. They need to fix this issue. Please add calendar to appear on Apple Watch Series 4 new watch faces. Thanks. Why do I suddenly have email popping up that is years old? This is so annoying. Please correct this. 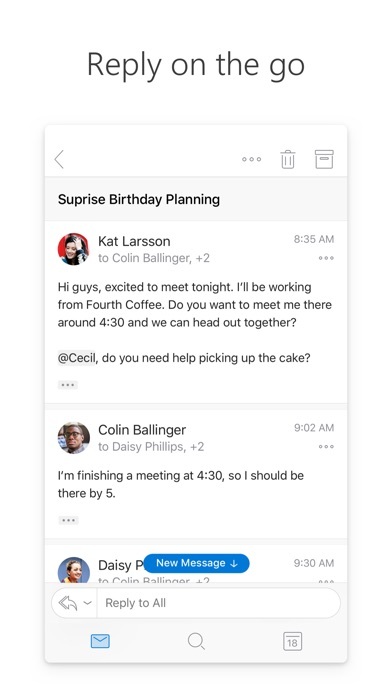 Outlook email is the best app for any email. You can make changes to all your setting for email, calendar and notifications. This app automatically signed me out. That's the first time an email app has ever done that. 1 star. Please stop showing me unnecessary notification badge. Even after I deleted the emails from notification, the counter on the app icon wouldn't reset. I have to open the app only to make the badge go away. Great email App however please add: 1.- Folder move autodetection. It will check email and suggest to what folder it should be moved. Like Apple’s mail App. 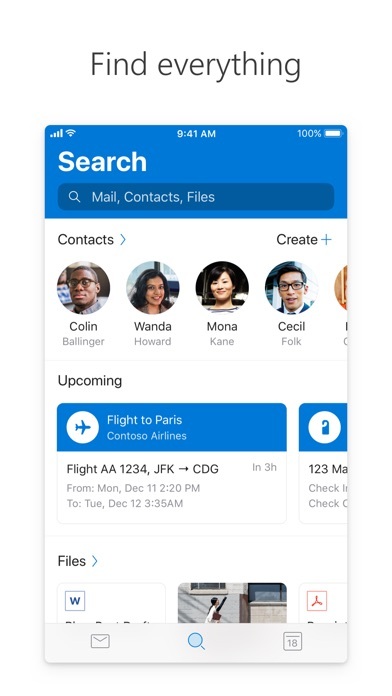 2.- Integrate it with Microsoft Teams so we can email, collaborate, Chat from the same App. While it’s not Gmail. The layout is simple enough to figure out when you thoroughly explore the application. I want to search my calendar only but have not been able to. Still showing the below: There’s nothing in any of my inboxes that is new, but it is now constantly showing a new message since last update. If I check my emails, it disappears. Then I close out of it in the background, and change my screen, and it reappears when I go back to the screen my email icon is on. Oh yay. Do I have a new email? Do I not? *sigh* ... Maybe you could be put in the calendar the ability to choose biweekly for a repeat option? It would be very helpful for things like dr appts and paychecks. I wanted to start using this app because i like the desktop version so i figured that the app should be nice also. I was wrong. I get some attachments from my work that come over as an HTML file. Well outlook app won’t open the file in a browser, it only opens the file as a document and displays the code for the webpage. Google and Apple email apps open these files perfectly fine in a browser. I contacted the support team through the app and they were useless. 5 days later i still wasn’t able to even come close to a solution and within those days i only got 3 responses that weren’t even helpful. In the end, I’ve deleted the app and moved back to google. Good luck! I don’t know why but this app is constantly freezing for me. Every other time I open it I have to restart the app and even then it will freeze on me right after. It’s wonderful otherwise but I’m probably going to switch to a different app because I’m so tired of it freezing. The App simply DOES NOT WORK. It's not about fast or slow, etc. I can't get in to begin with. I’m disappointed that the app doesn’t support .ics calendar file attachments. I can see that the email has an attachment when I’m looking at my inbox, but when I open the actual email, I cannot see the .ics attachment. Calendar functionality is a critical component of Outlook and I do not understand why .ics files are not better supported. 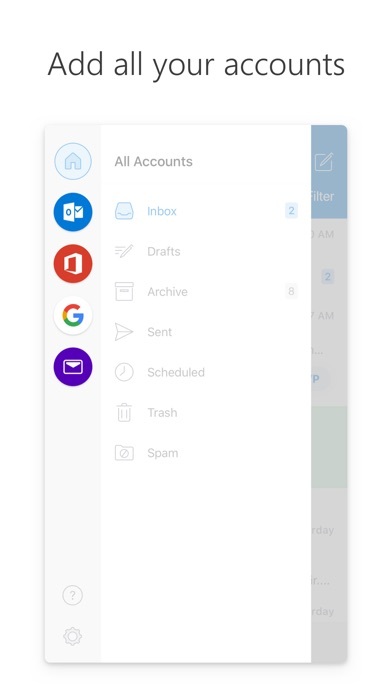 MS has really done awesome job with outlook app. Would give 9/10 for user friendliness. Emails are easy to search. All the functionality is just what I need. My only issue is that there's a like button to respond to quick emails (which replaces the time consuming "Thank you" response emails for me) on the web version, but there's no like button on any of the apps. With that addition, it becomes a five star app. Great job guys. Love the App now. Much better jobs on calendar items however can you improve the icons? They are almost faded and usability is poor. Making them a bit bolder with darker color will be perfect. Looking forward to the next round of updates. Cheers. My work uses Outlook for email and on my Apple iPhone 8, I will get a notification that I received an email. When I click on the notification, the email doesn’t appear on my phone. It will show up on my pc, but not on my phone. Decided to make the switch from google over to outlook because of school/work, but it has been a huge inconvenience! At first I thought the mechanics of the calendar portion of Outlook was easy to use. However, when inputting events into my calendar from my laptop, the events show up at different times and days from my outlook app on my phone! Clearly there a few kinks to figure out with this app because google would’ve never done this. It should be easy to use and consistent on ALL PLATFORMS! I have really started hating Hotmail. I get so much spam that you would think would be filtered. I’m beginning to move what actual email I get here to another provider. Very clean and user-friendly. I’ve always wanted the same email flexibility that I have in the office. Convenient, super easy to navigate in, and well-designed! Keep up the great work! Easy to use and convenient. Almost everything I need from the office while on the go. ALMOST. I wish it also integrated tasks. Just as important, but not integrated. Ever since the last update I am not receiving all of my emails on the app. I have to go into Office on-line to get all of my emails. The app itself does me no good when I can’t open my important emails. Is really frustrating because when I write emails and sent them they go to draft and the person can’t receive anything. I noticed that I’m not the only one having this issue. This is something that needs to be fix. Have used app for a couple of years with no problems on iPhone or iPad. Email still works great, but now all of a sudden I can’t open excel or word attachments. 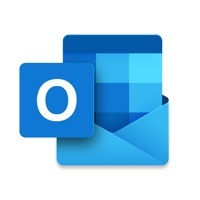 I can e-mail docs out of Outlook app to gmail on phone or iPad and they open. It is an app issue. 18.0 update didn’t help. Nothing has helped. Reset, deleted etc. support could not help, “escalated” to higher support and communication almost non existent. Mostly sporadic questions and no answers. We are a huge organization and this cripples our mobility. Now as I try to publish this less than stellar review at a one star it won’t accept even the bazaar nic names! I’ll change to Five star and if your reading this you know they manipulate what reviews are posted. That’s crazy. Good for businesses, Good for personal mail too. Seamless account switching! First of all, thank you for amazing app! Kudos to the team. 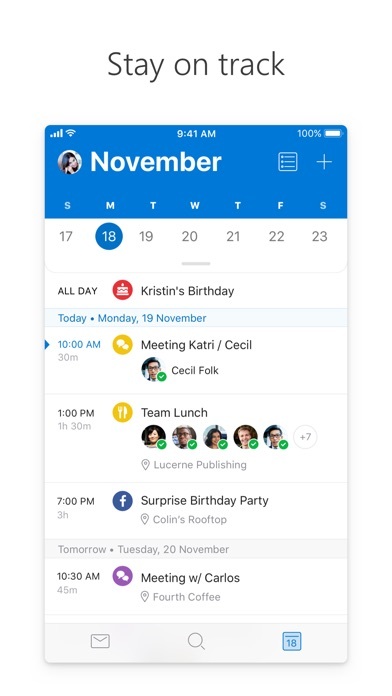 Is it possible in your future version, there is separate settings for notifications for calendar and emails? Currently, there is one and I get too many emails notifications on my phone and Apple Watch just to get calendar reminders. This will help me not sync iPhone calendar separately for this. I was using this Outlook app at my iPhone for more than a year, having deleted Mail app from Apple forever. I thought. By far so good app until issues with synchronizing start happening. I have tried everything by my self and also with support techs but there are bugs/issues that are always happening again. I use folders and subfolders. A2Hosting is my work-email provider. When I move mails from my inbox to subfolders, they aren’t moved neither at the server nor at Outlook for Mac. Same is happening with sent and draft folders. But, why?!? This wasn’t happening until two months ago!! Can someone convince me to still keep using this app? Will, finally, be an update that solves these issues? I've used this app for quite a while for my business E-Mail accounts, since I like to have them separate from my personal accounts. Nearly every time a new update is released, I have a problem. On four separate occasions ALL the E-Mail accounts were erased, forcing me to set up all my accounts again. I have quite a few. I've complained over and over about this problem in the APP, but it has not been fixed. 3 days ago they released a new version and yet again, ALL my accounts were erased. At this point I am cutting my losses, I am done with this application, it's just too buggy. A real shame for an APP with the Microsoft name attached to it. Their quality control on this APP is seriously not up to par with the reputation of the company as a whole. They have consistently missed the mark big time with this APP. I cannot forward emails since update! Any attempt to forward an email results in error message “ The message fail to send”. In the name of God please fix ASAP! Why isn’t my todo/task list available here too? I'm trying hard to like this, especially as I am trying to transition to all Microsoft apps and eventually dump Apple altogether. 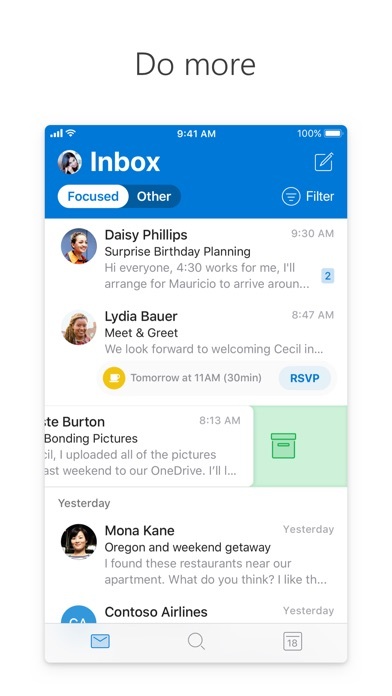 I like most of them, but this Outlook mail app I find trying. It may seem trivial, but there are several things that I can't seem to opt out of, that require multiple clicks to do simple tasks. For example, I set up swipe options to Delete is I swipe left. I swipe left, and it asks me if I want to "Delete Permanently." The answer is yes, I already said that when I swipe Left, i want to delete. DON'T ASK ME AGAIN! (Sorry I'mshouting, but it's aggravating if you have multiple mails to deal with...one more click.) Here is another: if I reply to a mail, it sends me to a tiny, one-line dialogue box (below the incoming note) to write it. Tedious, and extremely difficult to write anything extensive within. Sure, I can expand the box to full screen, but with another click. Please, why not default to full screen and let me opt for the tiny? Or give me a settings option to default to full screen. My point is that I find the personalized settings limited. Like so much software these days, companies invent options in the name of competition, then try to convince you their way is best. I will stay with this because I am trying to go all Microsoft before transitioning from an iPad to Surface tablet. But boy, this mail package is trying. If there are customizable options I am missing, please let me know.